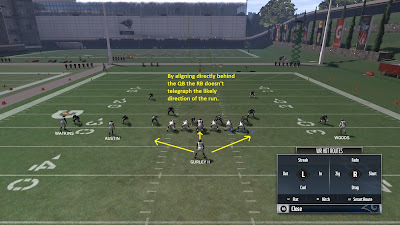 Based on backfield alignment the defense has a chance to guess where the play will be run. 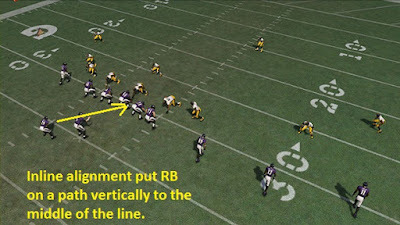 Shotgun inline formations usually indicate running plays to the opposite side of center from where the running back is aligned. The positioning of the RB slightly behind the Qb and to his side naturally makes the path of the running back toward the inside of the line of scrimmage. He can take more lateral paths but this involves steps that will allow for more pursuit time for the defense. 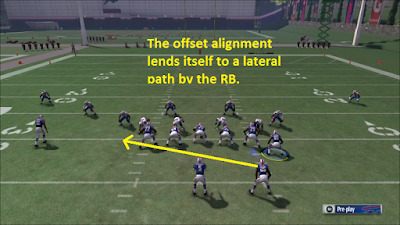 The offset position directly beside the Quarterback in the gun generally indicates plays in a more lateral direction. Examples of these plays would be outside zone and counter plays. This brings us to the traditional tailback position directly behind the quarterback. The reason this is a popular position for dominant tailbacks is that it doesn't give any indications on where the run will go pre-snap. This position can hit anywhere along the line of scrimmage with minimal slowdown by the back (Generally I like the under center and pistol run game more). The drawback is that in the passing game it is hard for the running back to affect the coverage because of the distance it takes to get from the center of the formation to the flats. Now some coaches like Chip Kelly use the predictability of the inline and offset formations to get defenders in predictable alignments. With prior knowledge fo the alignment, the defense is in he believes that he can better call a play that attacks those gaps. Also, he believes that his base play (the inside zone) is good enough to handle any alignment even if it's not ideal. 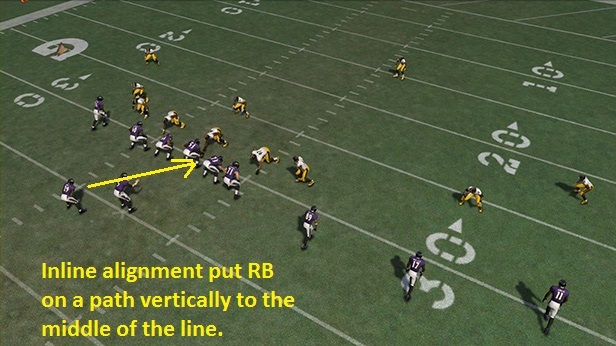 Defenses can make a good guess on the type of run by the backfield alignment. 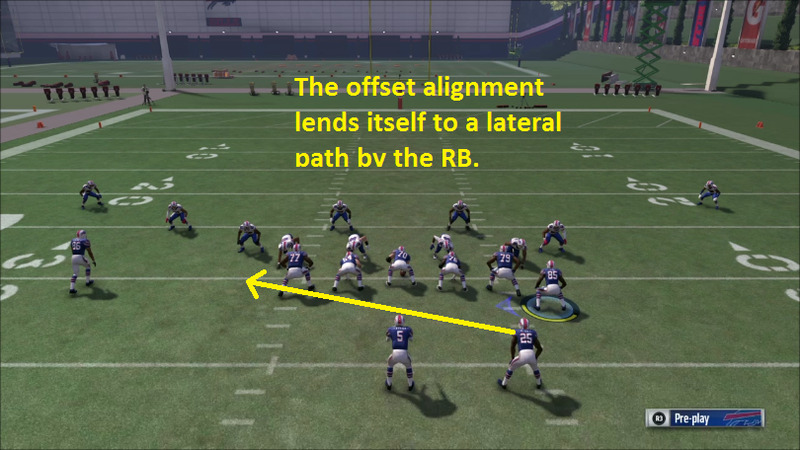 If the RB is aligned offset directly beside the QB he is likely going to run a lateral type run (outside zone, counter, sweep). - Good for lateral runs and getting out in horizontal pass routes. If RB is aligned inline beside the QB and a little behind he is likely going to run a vertical type run play (inside zone). - Good for inside runs and better at getting out in horizontal pass routes then behind the QB but not as good as offset. If RB is aligned directly behind the QB (under center, or pistol) he doesn't tip off the type of run play to the defense. - Good for disguising your run play but hard to get out in horizontal pass routes. Thank you for reading please comment and share.